Craig Lake Trail is known as a rugged hiking trail. 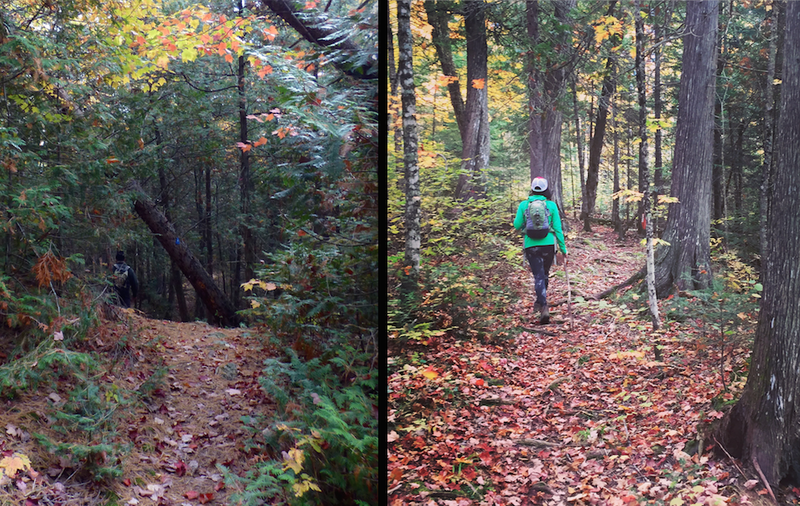 I found it to be a perfect day hike—8 miles of rolling terrain in a beautiful forest circling the quiet lake. The landscape is hilly, with a bit of climbing here and there, but nothing extremely strenuous. 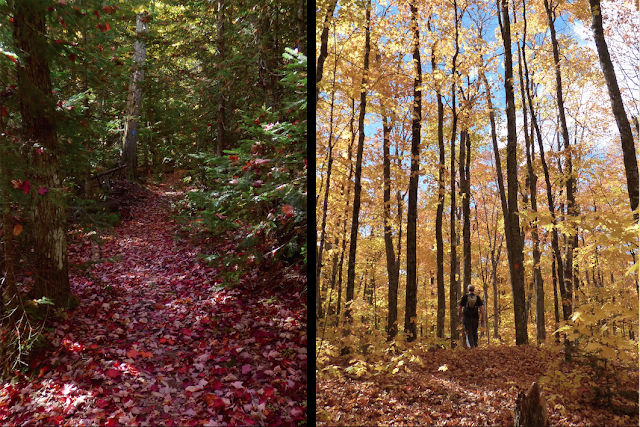 We finished the hike in just over 3 hours; it was a beautiful, chilly fall day, and I would’ve been happy to hike a little longer. 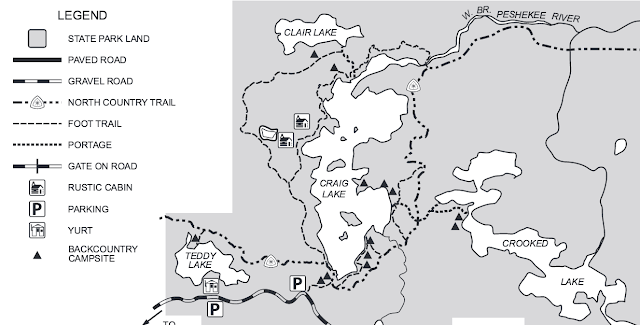 We left the yurt at Teddy Lake and drove to the Craig Lake Trailhead, about a mile away. There is no outhouse at the trailhead parking lot, which is unusual and a bit of a buzzkill if you arrive with nature already calling from an excess of morning coffee. After wandering around for a few minutes, I accepted defeat and ventured into the woods. There were only a few vehicles parked at the trailhead, and it was very quiet. Some of the signs along Craig Lake Trail have obviously been there for a long time, sporting a weathered, mid-century look. Trailhead signs point hikers to various spots along Craig Lake Trail, and toward the North Country Trail, which also meanders around Craig Lake on its 4,600-mile journey from North Dakota to New York. 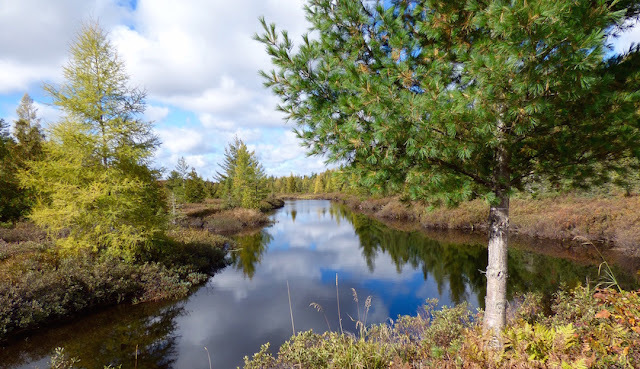 Our longest national scenic trail, the NCT shares a path with Craig Lake Trail along the east side of the lake before veering east toward its route through the McCormick Wilderness, then on to Pictured Rocks National Lakeshore, Tahquamenon Falls State Park, and beyond. We decided to head west and circle Craig Lake in a clockwise direction. 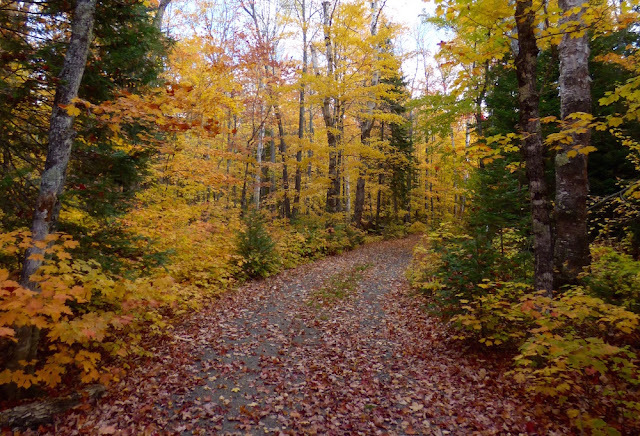 Craig Lake Trail starts out following an old two-track road, which is used as a private access road for park employees to service the park’s two rustic lakeside cabins. During our visit, it was buried in fallen leaves that rustled as we walked, making the only sound in the otherwise silent forest. 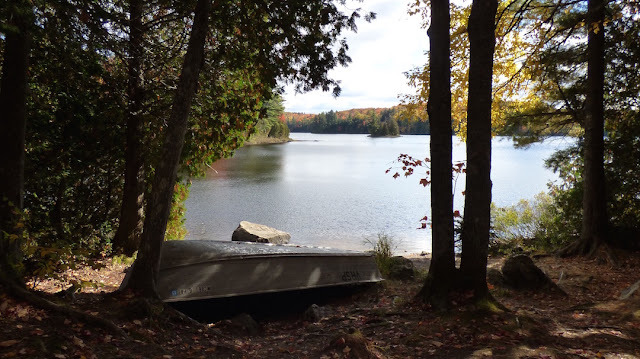 In about a quarter-mile, the trail leads to an open area along the shore of the lake that is a popular canoe put-in spot with a few campsites. There are also two outhouses, which I took advantage of on principle. From there the trail hugs the lake and heads north toward the park’s two rustic cabins - Miller Lodge and the Caretaker’s Cabin. Built in the early 1950s by Fred Miller of Miller Brewing Company in what was then his private fishing retreat, the cabins are now state park property and can be rented through the Michigan DNR. About a half-mile before the cabins, the trail/road crosses over High Life Creek on a short, one-lane bridge. The Caretaker’s Cabin is reached first; no one was there, so we spent a little time checking things out. The front of the cabin faces the trail, with a woodshed off to the side. In the back there is a fire ring and picnic table, and a nice view of Craig Lake. A rowboat was overturned and secured at the shore, waiting for the next guests to take it for a spin. We moved on and reached Miller Lodge about a minute later. There were people at this cabin, so we didn’t explore it. 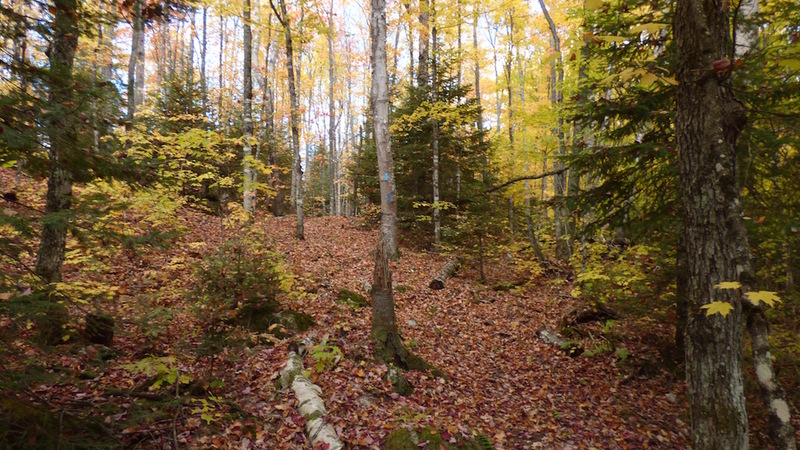 Here the overgrown road ends and the path continues north, becoming a proper hiking trail, disappearing into the trees behind the cabin and beginning to curve around the north end of the lake. 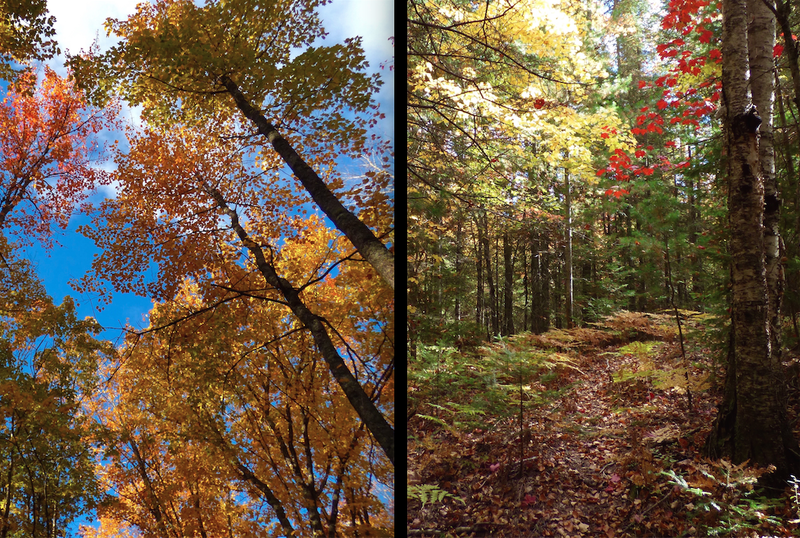 The forest was aglow with color—a variety of green, yellow, orange, and red shone around and above us, and blanketed the trail below. Every once in a while I looked up to catch glimpses of the vibrant blue fall sky framed by multi-colored leaves. Enormous boulders appear here and there along the trail—glacial erratics deposited during the last ice age. 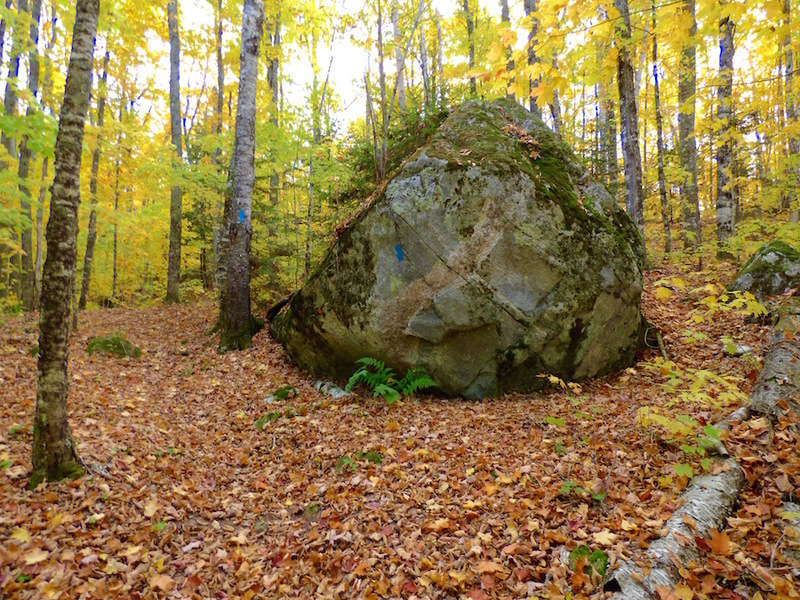 Glacial erratic. I love these guys. 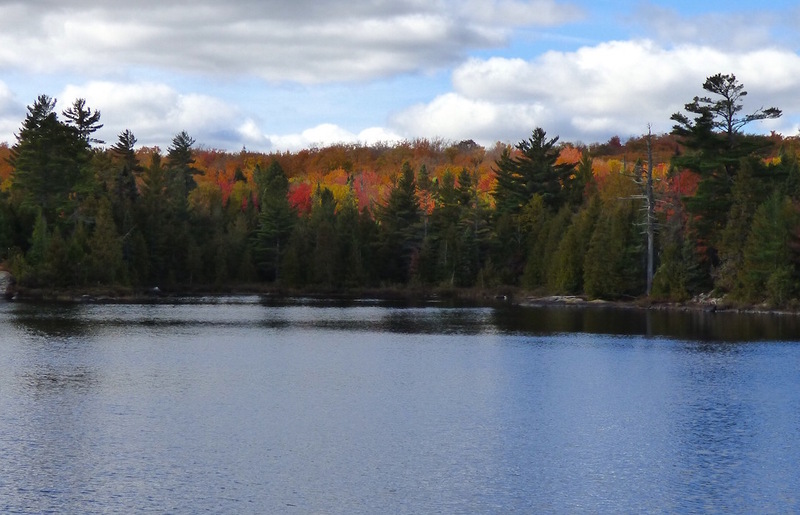 At the north end of the lake, we reached the backcountry campsite near the portage to Clair Lake. 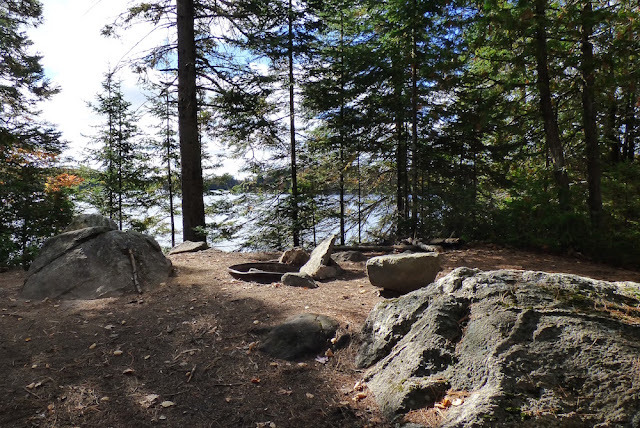 There is a fire ring, small area to pitch a tent, and a wonderful view of Craig Lake. The trail passes Craig Lake Portage and crosses a small stream over a wooden footbridge before climbing to a rocky bluff providing another nice view of the lake and surrounding trees sparkling in the bright sunlight. The trail descends back into the forest and to the Peshekee River, which is crossed via a suspension bridge that was built in 2014. Before that, hikers crossed the river using a fallen log. 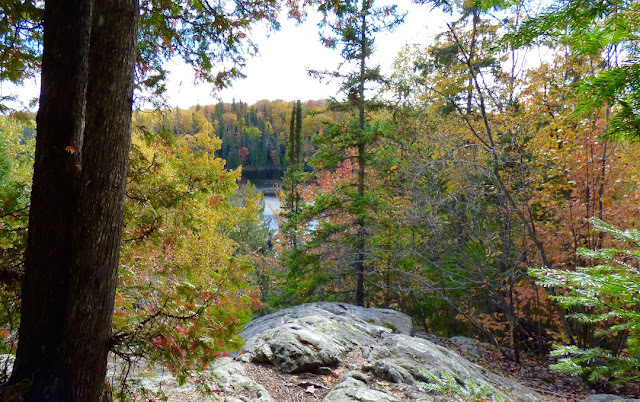 The trail heads south along the east side of the lake, over hilly terrain. 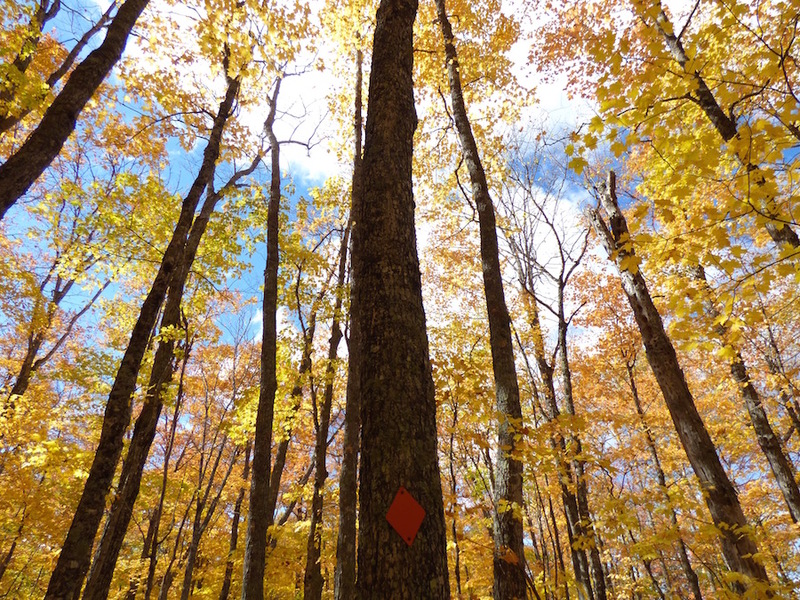 This part of the trail wanders through stands of tall maple trees, whose leaves were a striking, luminescent yellow at this time of year. It passes more backcountry campsites on Craig Lake and crosses the portage to Crooked Lake, where additional campsites can be found. 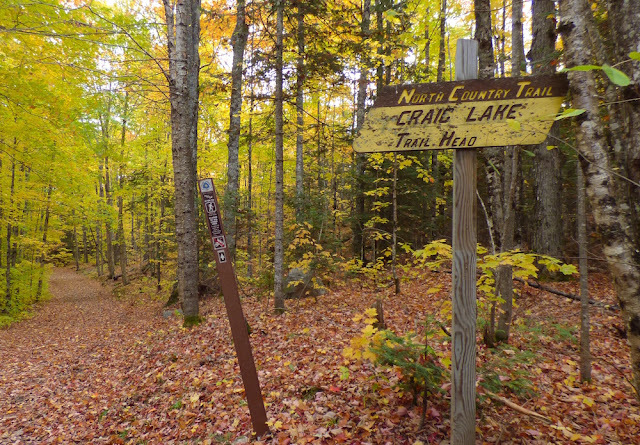 The trail curves around the south end of the lake and passes a path to more campsites on the shore of Craig Lake, referred to as the Sandy Beach Campsites. Shortly after, the trail arrives back at the beginning of the loop. Turning left brought us back to the trailhead parking area in about a quarter-mile. We returned to Teddy Lake and spent the rest of the day at the yurt, eating hotdogs, reading, and keeping warm near the wood stove. It was a day well spent. It's been about 4 years since I lived in the UP, but the "The trail begins on an old road" photo made me feel like I was right back there in the middle of a wet fall day. It brought up all of the smells, sights, and sounds in that kind of woods. Gosh, I miss it. Thanks for the post -- I'm really enjoying seeing the UP in the fall again!